Agriculture forms a significant component of the total land use patterns in the Wimmera. The dominant agricultural activity, in terms of both land area and value of production, is broadacre cropping. Plantation and farm forestry, as well as exploration for mineral gypsum are also significant uses of private land in the Wimmera. Public land accessible in the Wimmera includes the Mt Arapiles-Tooan State Park, Little Desert National Park, Wyperfeld National Park and several lakes in the District are used extensively for recreation. Management of Crown Lands in the Wimmera is the responsibility of the Department of Environment and Primary Industries and Parks Victoria. 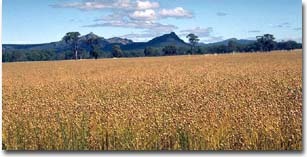 Linola cropping with Grampians National Park in background. The Landuse map is intended to provide an overview of agricultural and other land uses throughout the region. 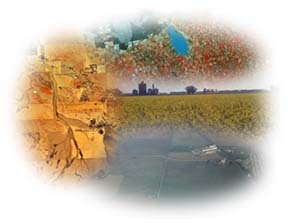 Data used to generate the map was derived from the land use layer (LANDUSE250) of the former Department of Primary Industry’s Corporate Geospatial Data Library. This layer contains polygon features delineating broad agricultural land uses. The map is based on general information obtained by satellite image interpretation (1991) and from other statewide datasets. It is a general indication only, of land use and land tenure across the Wimmera. The dominant agricultural activity, in terms of both land area and value of production, is broadacre cropping. Over 60% of the land used for agriculture is utilised for extensive cropping of grains, pulses, oilseeds and pasture seed production (TBA Planners, 1998). Early European settlement of the Wimmera saw woodlands capable of yielding timber cleared to make way for agriculture (LCC, 1985). However, recent forestry operations have reforested some areas in the West Wimmera, concentrating on producing furniture and woodchips products from Red Gum plantings. Plantation and farm forestry are becoming significant land uses in the far west of the Wimmera catchment region. Commercial tree species grown in the region include Radiata Pine (Pinus radiata), Blue Gum (Eucalyptus globulus) and River Red Gum (Eucalyptus camaldensis), while species with commercial potential are numerous. Exploration for mineral gypsum in parts of the Wimmera has taken place in the past, while minor amounts of salt have been extracted as well as gold, stone and gravel in significant quantities. Brown coal exploration has also taken place without significant economic yield. Such activities have altered landscape morphology significantly in some areas. Land Conservation Council (LCC) Victoria (1985). Report on the Wimmera Area, LCC. Melbourne. TBA Planners Pty Ltd, (1998). Wimmera Demographic and Socio-Economic Profile. Report compiled for Wimmera 2020. Wimmera Mallee Water, (1999). 1998/99 Annual Report, Horsham. Wimmera National and State Parks This map shows the location of State and National Parks in the Wimmera region, and in nearby regions (as at January 2004). Parks Victoria manages Victoria's world class network of national, state, regional and metropolitan parks, other conservation reserves, many significant cultural assets, and Melbourne's bays and major waterways. The Parks Victoria Parkweb (external link) website provides information about each of Victoria's National and State Parks. The Wimmera provides access to Mt Arapiles-Tooan State Park, Little Desert National Park, Wyperfeld National Park and several lakes in the District are used extensively for recreation. Provides new information technology developments and initiatives to support cadastral and natural resource decision-making and program delivery. The Parks, Flora and Fauna (PFF) Division of DEPI is responsible for overseeing the management of Victoria's public land and resources for their environmental, conservation and recreational values. PFF is also responsible for supporting the conservation of historic places on public land, overseeing the management and use of Crown land. On-ground management of land use activities has been undertaken by Parks Victoria (external link) since December 1996. Its main purpose with respect to Crown land use is to conserve, protect and enhance environmental and cultural assets throughout the Wimmera catchment region of Victoria.